While the shock of Joe Maddon’s sudden exit from his longtime position as Rays manager lingers on, a question begs to be answered between now and Spring Training 2015 — who will take over in his wake? On the short list; former Ray and current MLB consultant Gabe Kapler, one time Rays minor league coach Tim Bogar, John Flaherty, Joe McEwing, Durham Bulls manager Charlie Montoya, Alex Cora, Sandy Alomar Jr., Eduardo Perez, and — last but not least — Rays bench coach Dave Martinez. 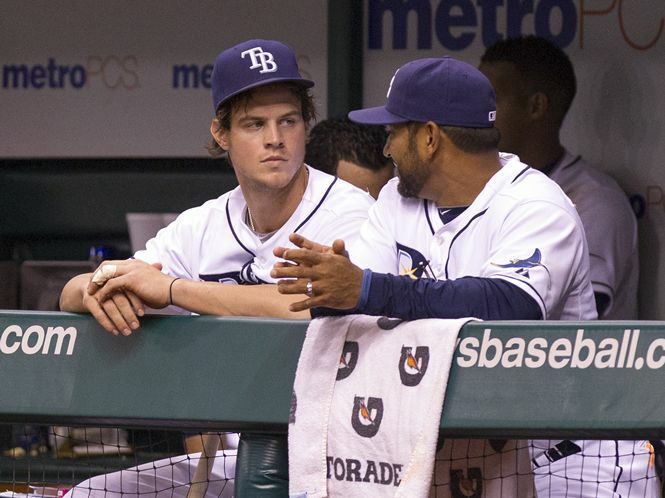 The Rays didn’t have enough money to pay Joe what he thought he was worth — a reported $5MM annual salary. The Rays didn’t want to pay Maddon a sum total of $25MM over five years. That is, whoever they hire will be earn significantly less than what Matt and Stu were willing to offer Joe — a figure in the ballpark of $3MM per year. If you’re under the impression that Maddon will end up with the Dodgers, and Don Mattingly will miraculously end up with the Rays, wipe that notion from your mind. Two names, from the short list above, piqued my interest: Martinez and Montoya. Both presumed managerial candidates are familiar with system and personnel, however, one thing separates Charlie from Dave — experience in coaching/managing at the major league level. Martinez has served as the Rays bench coach since the 2008 season, making him the longest tenured bench coach in franchise history. He has been a part of each of the Rays’ four postseason runs, with the club posting a 550-423 record under the watchful eyes of Martinez and Maddon. An oversimplification sorts, partially because neither Silverman nor Sternberg have made public what they want out of a manager, Martinez could be the perfect fit to take over Joe’s role with Rays. Thanks to his experience of working under Maddon, Martinez knows how he likes to work and what makes him successful at what he does. It should be assumed that Dave would apply many of the same principals as Maddon while also putting his own spin on things in the clubhouse and on the field. Yet the peripherals surrounding the search for a new manager could prove to be one of the biggest determining factors of who will be hired. Maddon’s departure puts in limbo the coaches, all of whom are signed for next season but won’t necessarily have jobs under the new manager. For example, if (under a new regime) the current coaching staff is free to look for employment elsewhere, Derek Shelton could end up as the top candidate for the hitting coach position with the Yankees. And while the loss of Shelton may not seem detrimental to the future of the organization, the loss of someone like Jim Hickey could. With Martinez or Montoya at the helm, an overhaul of the entire coaching staff could be avoided. Martinez is ready to manage, and has been wanting to for several years now. If the Rays don’t allow him the opportunity, he could very well be the next member of the coaching staff to seek employment elsewhere. “Before Matt Silverman comes up with a list of candidates to talk with about replacing Joe Maddon as Rays manager,” wrote Marc Topkin in his latest piece for the Tampa Bay Times, “he has to decide what type of person he is looking for.” In doing so, the Silverman is listening to the players about the type of manager they want. One thing is certain, the Rays front office hopes to “keep a lot of things the same,” indicating someone with at least some of Maddon’s traits. Per Topkin, one priority will be the ability to maintain the positive clubhouse atmosphere. Openness to incorporating analytics and advanced statistics will be important, as may be similar ideology in roster construction. Relishing the small-market challenge will be a boost philosophically. If Ben Zobrist and Chris Archer’s comments (quoted below) speak to anything, it’s that Dave Martinez may be the best option going forward.